the air conditioning field not sales classes. evaluation. Our technicians are not paid on commission and will not sell you parts you don’t need. part of an inspection. Our technicians will rinse your condenser coil and inspect your indoor coil for dirt or blockage. home at no charge to verify the problem. If you sign up for our maintenance agreement you will receive two yearly services on air conditioning system. One in the spring to ensure your cooling equipment is running at peak efficiency and another in the fall when we will check the heating system and all safety devices. Along with the two services you will also receive a 15% discount on any repairs needed though out the year and priority service which is very convenient should your unit fail in the heat of the summer. 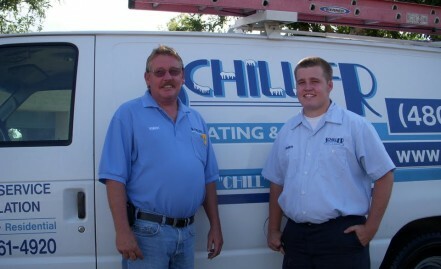 At Schiller Heating & Cooling we work on a flat rate basis. This allows the technician to diagnose any problems and give you an exact price prior to any work being done. No more surprises on the bill once the work is done.